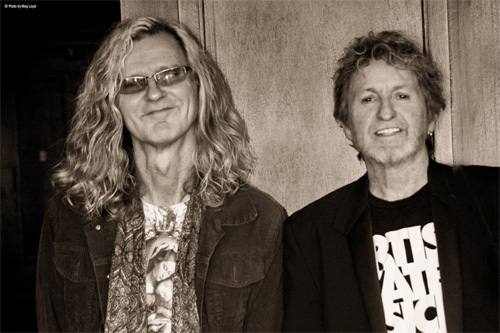 Former Yes vocalist Jon Anderson kicked off a tour with two of his old band mates, Trevor Rabin and Rick Wakeman on October 4; Anderson Rabin Wakeman already has dates scheduled into the end of March 2017. But in June 2016, Anderson released the product of a collaboration with Swedish multi-instrumentalist Roine Stolt (Flower Kings, Transatlantic, Steve Hackett‘s touring band). Credited to Anderson/Stolt, Invention of Knowledge brings together the best qualities of Yes and Stolt’s projects, creating a progressive rock album that is both rooted in the music of the 1970s and designed for modern prog fans. The idea of Anderson and Stolt working together came originally from Thomas Waber, founder and head of German independent record label Inside Out. The first time the two played together was on board 2014’s Progressive Nation at Sea cruise. Their on-board rehearsal and subsequent performance – a live version of the entire first side of Yes’ 1973 double-album Tales From Topographic Oceans – sealed the deal. Because the two were separated by geography – Stolt at home in Sweden, Anderson in California – music of Invention of Knowledge was put together via file-swapping. But the organic-sounding results belie the manner in which the record was created. I recent spoke with Jon Anderson about his collaboration with Reine Stolt, as well as the prospect of the two working together in the future. Reine Stolt and Jon Anderson. Photo by Meg Loyal. Bill Kopp: Both you and Roine approach music from what I would call a spiritual perspective. The specifics of your beliefs may differ, but there is, from my point of view, a shared sensibility. Can you speak to how those perspectives informed the music on Invention of Knowledge ? Jon Anderson: I think we are very much the same sort of musician. He is a great believer in progressive music of the ’70s. He started his band, Flower Kings, in the ’80s. He loved ELP, Yes and many of the bands of that ’70s. Of course he sort of understood what I was singing about lyrically in the ’70s, which was always about opening up your spiritual sensibility, that we are very divine beings on this planet. That’s all of us, not just one part. [We’re] collectively one spiritual energy. And you can think about that in so many different ways using nature as a platform. When I sent him the first songs for the project, it was all about being positive. Because if you’re not positive about your understanding of life, you won’t find out the mysteries of life. There are so many mysteries about why we live. Most people just get on with life as though, well, “This is a life and we have to die” and all that kind of thing. But I don’t believe in that; I believe we’re here for certain reasons, [and] to evolve. You know, both emotionally, spiritually and physically. And musicians ought to be evolving musically. And I think that Roine understands that. So many artists today do their recording by flying tracks back and forth over the internet, rather than spending time in physical proximity to each other in the studio. Obviously there are advantages to both of those approaches. Tell me about the making of Invention of Knowledge . We did everything through the internet. We met 2 years ago, and then we met about 2 months ago in Los Angeles. So we met physically twice, and made an album that sounds like we are in the same world. We are! We’re actually on the same planet. And with all intents and purposes you don’t make music thinking what it’s going to sound like when we’re not in the same room. You make music because you love what you’re doing, and [because] you love the connection. There are good musicians that Roine works with, and basically I left him to do all the music. Because that’s his forte. He’s a great producer. I just wrote the songs and lyrics and helped to evolve what he sent back to me. I would send him a piece of music that was just with the string section, and he would send it back with a full band playing it. He was quite remarkable. I would hear the music back a week later in a totally different way, and then I would add more. He wold add extra music, and then I would add song parts to the music that he sent. So actually, we did rather a lot of music together. So there was a good bit of back and forth, then. Yeah. I actually have a friend here who helps me, a young kid who is a really talented. We would work out the orchestrations with his keyboard player, and that’s how a lot of the orchestration parts became. Over the course of your career you’ve collaborated with many, many artists. For you, what made the experience of working with Stolt different from the others? I think most of all, technologically it was incredible. I remember working with Vangelis thirty, forty years ago. And that was remarkable to work with somebody who was very spontaneous musically. Everybody I’ve worked with has been very, very different, so working with Roine we were able to create a very warm, fresh sounding album without having been in the same studio. So that, in itself, is remarkable to me, in my life, [that] in my world now I can actually co-create with people all over the world and have the music still sound as though we were sitting there together, creating it. So that was the wonderful part. You have to have trust in somebody, and I have great trust in Roine’s talents. And that comes over on the album, I’m thinking. You both have very busy schedules. Are there any plans or even thoughts of plans to present any of this material in a live setting at any point? Yes, we’d love to perform it next year. I think next summer [we could perform at] rock festivals around Europe. We’ve been talking about setting up a couple of them to do especially with orchestra and choir and the band and musicians. We’ll see if we can get sponsorship to help finance the whole project, and then perform. Yes. I already have something ready to go; it’s a question of timing. Probably something will happen in a year or so’s time, but not right now. But I am very interested in jumping on some. We actually worked on Invention of Knowledge for over a year and a half, and now I’m thinking of totally different musical concepts.